For the remainder of the year, all grades will be recorded in the PowerSchool gradebook program. You can check your grades at any time by clicking HERE or on the PowerSchool link to the right. Let's begin this term by studying some consumer skills in math. Over the next week, we will focus on finding sale prices (percent off) and calculating sales tax on items. This is a skill you will use for the rest of your life...just ask your parents! We will work together in class and then you will be given homework Monday and Tuesday night to complete. In addition to this work, please complete your journal (it's all about finding sales prices) and your TenMarks activity by Friday. In science, we will continue our talk about plate tectonics, but talk more specifically about the landforms that are created as a result of shifting lithosphere. 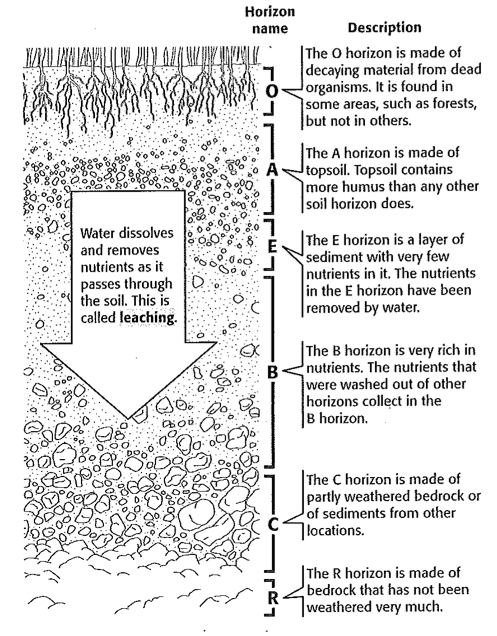 Here's a great introduction to some of the different landforms we will talk about. Over the next two weeks, you be studying such landforms. Please use the following choice sheet to guide your research. Please note that this assignment is due THURSDAY, November 8th. The flat land along a stream or river that floods on a regular basis, sometimes every year. There's a lot of information out there on the Internet about landforms, but I would suggest starting your search at the National Geographic Landforms site. It is thorough, well researched, and includes many great pictures. I will be attending the National Science Teacher's Association conference in Atlanta this week. I will be out Thursday and Friday. I'm expecting wonderful grace and courtesy from you while I am away. Be sure to keep checking the blog while I'm gone, because I will be posting pictures of all the awesome science stuff I see! Ms. Carol and myself will be continuing parent/teacher conferences this week. We've really had a nice time meeting with families, and I look forward to talking to those who have conferences scheduled for this week. If you need to cancel your conference for any reason, please contact me ASAP so we can reschedule. 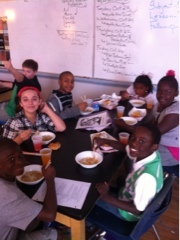 We really enjoyed our chicken soup for lunch today! 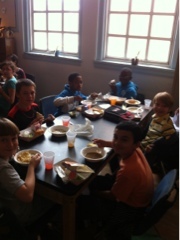 Thanks, Ms. Carol for organizing the lunch. 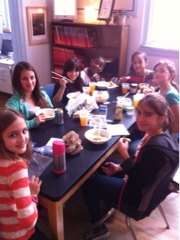 A special thank-you to all the families who donated soup! Don't forget that tomorrow (Friday) is picture day, and (since it is the last Friday of the month) it's also a dress-down day! 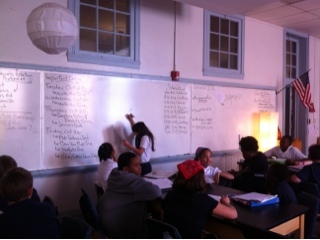 Today, we reviewed ratios and percents in preparation for tomorrow's quiz. Students made wonderful teachers as we discussed finding percents of numbers and plotting ratios on coordinate planes. Starting next Monday, you will have 24/7 access to your grades through the PowerSchool Parent Access program. To gain access, please see Ms. Esther in the front office for your log-on information. You must show Ms. Esther a photo ID to get access to your account. I've attached a copy of the documentation you will receive at your child's parent/teacher conference. I would suggest just stopping by Ms. Esther for your logon when you come in for your conference. We will not be sending progress reports home today since parent/teacher conferences will start tomorrow. Please return your request form if you have not done so already. I'm looking forward to seeing you at conferences! When sitting down to plan this week, I quickly realized that we have A LOT going on! I'm ready to see the exciting things this week will bring! Are you ready to join me?!? In Math we will continue our discussions about ratios. This week, we will use equivalent ratios (proportions) to solve percentage problems. Get ready for classroom lessons and homework (Monday and Tuesday evening) to help you prepare for a quiz on Thursday. Your TenMarks assignment will also help you prepare. Below is a great resource you can use to practice ratio work. It includes everything we've been talking about, and there is an answer key located at the end. Feel free to use it for extra practice. The topic we are focusing on this week starts on page 37. Please use this week to finish your work and prepare for your test. As an added science bonus, your journal topic deals with plate tectonics, too! 1. I will be attending a meeting this Thursday morning. I'm expecting exemplary grace and courtesy when the substitute teacher is working with you. 2. This Friday is Fall Picture Day. Be sure to wear your smiles...it's also a dress-down day! 3. This week is Red Ribbon Week! Coach Leslie has some fun things planned to celebrate being drug-free. 4. Parent/Teacher conference start this week. If you have not done so already, please complete and return the conference sign-up sheet. I will sent home a note stating your conference date and time. It is best if your child attends the conference with you. Here's a great resource from the Harvard Family Research Project that may help you get the most out of our short time together. Busy, busy, busy! Let's get this week started! We've been busy this week researching tectonic plates and the theories associated with the supercontinent Pangaea. Students have relied on many sources for research, but have really learned a lot from such websites as www.brainpop.com and the online Encyclopedia Britannica. Brainpop and Encyclopedia Britannica offer a vast amount of research materials. 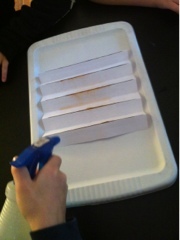 In addition to these online resources, students are enjoying hands-on models showing the movement of the continents and continental/oceanic plates. Today, Ms. Cathy brought in an awesome model from the Savannah State University Marine Science School that shows how tectonic plates meet to form boundaries, such as the mid-oceanic ridge. Pangaea: One Giant Jigsaw Puzzle! Can you believe it's time for first term conferences?!?! I've sent home the attached conference sign-up form. Please review it, choose at least 5 times that are most convenient for you, and return it to your child's homeroom teacher by this Friday (October 19). I will send home a slip of paper stating your conference time as soon as I get your preferences. We will try our best to accommodate one of your choices. I look forward to talking to everyone about the amazing things going on here at Ellis! We've been spending a lot of time this year focusing on following procedures, practical life skills, and working together as a community. Such skills are just as important as anything you will learn in your core subjects because they enable you to enjoy an optimal learning environment. As a Montessori teacher, it is my goal to help you reach a point of comfort and self-regulation that you and your classmates can function in the classroom even when I am not present. On Monday, I will not be a school. Please keep in mind all the procedures we've put in place. I'm expecting a positive report when I return. On Monday, Ms. Diane wil introduce the science vocabulary words for the week. She will teach you some study tips to help you prepare for your vocabulary test on Friday. When I return on Tuesday, I will get you started with our next science topic: place tectonics! I will share the following presentation, and we will work together to fill in the missing words during our lesson. Here are your vocabulary words and a study guide for next Friday's chapter test. To help focus your studies, I invite you to complete the "Clean Your Plate" choice sheet. Three connecting activities must be completed by the end of worktime Friday, October 26th. In math, we will be taking a look at graphing ratios. This lesson will combine what we've been studying about ratios, and line-graphs that you've studied in past years. I really think you will enjoy making the graphs! Here's an awesome site that shows what we will be doing. You will have math homework Tuesday and Wednesday evening. In addition to this, please remember to complete your weekly TenMarks assignment by Friday. Enjoy the rest of your weekend! I'll see you Tuesday morning. With so much talk about the importance of soil, it's obvious that this natural resource deserves our protection. We used models to represent fields that have been plowed using soil preservation techniques (like contour plowing). Such practices can really go a long way in protecting our topsoils. Many people associate George Washington Carver with peanut farming, but his research in soil fertility also influenced farmers to change their planting strategies to increase their harvest. 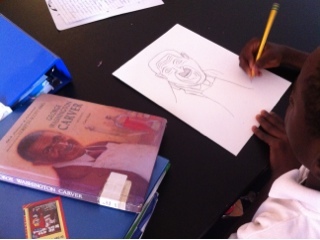 Here a student creates a portrait of Mr. Carver while researching his life and work. Do you have what it takes to be a spelling be champion? Ms. Rebecca, our media specialist, just announced the 4th-8th spelling bee which will take place in January. Start brushing up on your spelling skills! The following guides and much more can be found at www.spellingbee.com. What beautiful weekend in Savannah it has been! I hope you've taken advantage of every second of your time off, and I look forward to hearing about how you spent your weekend when we gather back at Ellis tomorrow. This week in math we will be talking about ratios and rates. Your first questions may be "what in the world is a ratio!?!?" Well, you will soon come to see that the work we've been doing with fractions and division fit nicely into our ratio lessons we will have this week. You actually already have all the knowledge you need to be ratio/rate experts! This site has some great explanations as to what ratios are and how you may use them in your daily life. Do you want some more practice with ratios? Check out this game. For even more practice, be sure to complete your ratio TenMarks activity this week. It is due by Friday. You will have two homework assignments, also. All this practice will hopefully prepare you for a quiz on ratios this Thursday. Ms. Carol and myself will be sending home progress reports this week. Please remember to review it with your family, sign it, and return it to your homeroom teacher Tuesday morning. If you have any questions or comments, simply write them on the coversheet of the progress report, and we will get back to you as quickly as we can. 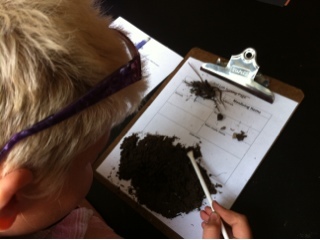 This week we've spent a lot of time taking a close look at soil. Students shared their discoveries many different ways. 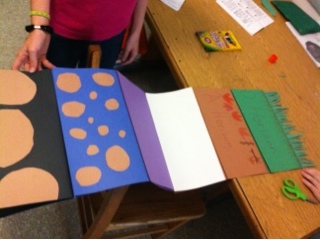 Some created large flip books showing soil horizons while others dissected soil into and placed it into different categories. Today, I sent home a permission slip for the Tybee Burton 4-H Center. We will be visiting the center November 14th. I'm excited to share that we will be taking a close look at coastal critters and dissecting sharks! The trip will cost $15.00. Slips and money are due no later than November 7. Please have your child pack a brown-bag lunch (school lunches will also be available for purchase). Please let me know if you have any questions. To introduce the concept of chemical weathering, I told the story of Hachiko. 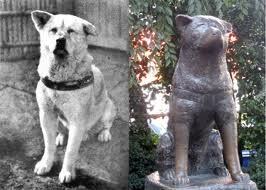 Hachiko is considered to be one of the most loyal dogs that ever lived! A bronze statue of him can still be visited at the Shibuya Station in Tokyo. Chemical weathering, caused by thousands of people petting the statue's paws for good luck, has caused it to get worn down. There's a great movie about Hachiko that was made a few years back. Here's the trailer. The movie is available on Netflix.